The word “great” seems used a lot whenever you may find a Speed Zooka review. But why exactly is the Zooka ZS740 Pitching Machine great? Is it really a piece of baseball training equipment that teams will find useful and worthy of the money? It can be argued that pitching machines aren’t absolutely necessary to train your young baseball players. You can always rely on your own manual efforts. But countless Speed Zooka reviews written by ecstatic parents and coaches insist that this is actually worth every penny. It’s well-made, versatile, and durable, and your team will really get better. The Zooka ZS740 is a machine that looks like a futuristic space rifle with a handle on top, and it’s mounted on a tripod. Its main function is to throw balls, and this lets you use it as a pitching machine so players can practice on their hitting. In addition, you can set it up so that your fielders can practice dealing with high fly balls and grounders. However, this isn’t really limited to just throwing baseballs. It can throw softballs and wiffle balls too. It can also throw tennis balls, which makes it safe to use around very young players. The ball is powered by an internal air compression system. There are no spinning wheels and other external moving parts. It also features a digital control panel, and you can adjust the speed settings easily from 10 to 70 mph. In fact, you can even preprogram the machine to throw pitches at different speeds and locations. This simulates game play scenarios. 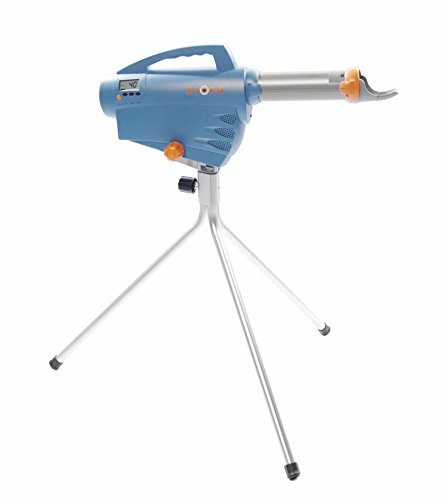 The tall panning tripod lets you turn the machine a full 360 degrees, while it’s set at a 43-inch pitch release height. The machine uses rechargeable batteries. There are no wires during practice that players and coaches may trip over. This also makes it a lot more portable, and it helps that it only weighs 30 pounds. At full charge, you can get at least 500 throws from the machine. The maximum speeds can approximate real youth pitching. It can also throw baseballs up to 12 stories high in the air so fielders can practice with fly balls. You can buy a separate battery pack so you can be truly sure that the machine won’t give up on you during practice. You can also buy an auto ball feeder so a player can use this even when they’re alone. There are plenty of good reasons why you’d want to get this Zooka ZS740 Pitching Machine over any of its competitors. First of all, this is very easy to use. It’s rechargeable, so you can just recharge overnight when you’re not using it. Get a separate battery pack as a spare and you’re good to go. Once you have it on the field, you can just adjust the settings to give you the speed of throws you want. You can even preprogram the thing so that it can throw in different speeds and directions. The setup with the tripod and digital control panel is a snap. It will only take you about 2 minutes or so to prepare. Once you’re done, you now have a machine that helps your batters deal with different speeds of pitches. This can throw baseballs high up in the air, so your outfielders can practice catching fly balls even when the sun is shining. You can point the turret at the ground, and now your infielders can practice dealing with zippy ground balls bouncing all over the place. It’s great that it can throw a wide variety of balls. This allows you to use it for softball practice too. In fact, even tennis players can also use this. The use of tennis balls is also great for some young players. This is for those who may worry about getting hit by a baseball travelling at 65 mph. The durability of this machine is also outstanding. It’s great that there aren’t really any external moving parts, so it eliminates a potential weak spot that may malfunction. There aren’t belts either. The air compression makes it extremely efficient, and it’s designed to work flawlessly for many years. It can last quite a while with just a single charge, though it is recommended that you get a second battery pack as a reserve. Each charge lets you work with 500 throws and pitches, so having two packs should last for an entire afternoon of baseball practice. Perhaps the most annoying weakness of the Zooka pitching machine is that the quality and strength of the pitches become more inconsistent as time passes and the batteries lose more juice. It would have been nicer if it worked flawlessly until it won’t work anymore because it needs a recharge. So instead of working at 100% while the battery is powered, the quality of the throws and pitches also gradually lessens. While it is admittedly portable, you still have to carry it wherever you go. There aren’t any wheels on this thing. Finally, the air compression may cause just a tad bit of damage on leather baseballs. It’s not really noticeable right away, but over time the baseball may fray on the sides after a while. This is one heck of a pitching machine, and it’s easy to understand why the vast majority of Zooka pitching machine reviews give it perfect scores. It does what it’s supposed to do, and it’s very easy to use. You can bring it everywhere, and you can sue it to improve the hitting and fielding skills of your baseball players. What’s more, it can last for many years. This isn’t just a supposition, as some owners have been using this machine for the last 6 years without complaint and a lot of grateful praise. Buy this gadget, and you can pretty much guarantee the improvement of your team practices and the skills of your players. If this Speed Zooka review hasn’t convinced you there are other options. You can check out the Louisville Slugger Blue Flame or the Hack Attack pitching machine just to name a few. Want this Zooka ZS740 with Free shipping?